Buying perfect wedding bands is one of the most significant decisions you will make when getting married. Symbolically, wedding bands represent a lifetime of commitment and love, so choosing the best type of metal to last forever is important. The noble metals, silver, gold, platinum are the traditional choices for wedding bands, but palladium is on the rise. Each of these metals have individual characteristics of hardness, durability, and scratch resistance. While one metal may be harder than the others, this does not necessarily mean it will last longer than other metals. The decision you make depends on your budget and what colour metal you prefer. With regard to cost, consider your baseline about $1,800HKD per ring for a simple 3mm wide yellow gold wedding band. Like you and your nascent marriage, each metal also has it’s own unique characteristics – one of them will be the perfect match as your symbol of eternal devotion. Silver, platinum, and white gold are considered “white” metals when used for jewellery, although they are all silver in appearance. The three metals may look similar, but they are very different in content. Silver is comprised of 92.5% silver and 7.5% other metals or alloys. An alloy is a mixture of metals. The alloys are added to make the silver more durable. Look for the 925 stamp inside your ring which verifies it as Sterling silver. Are you tough on your jewellery? Silver is the softest of the three metals and prone to scratches. It can look beautiful and aged but the look doesn’t appeal to everyone. 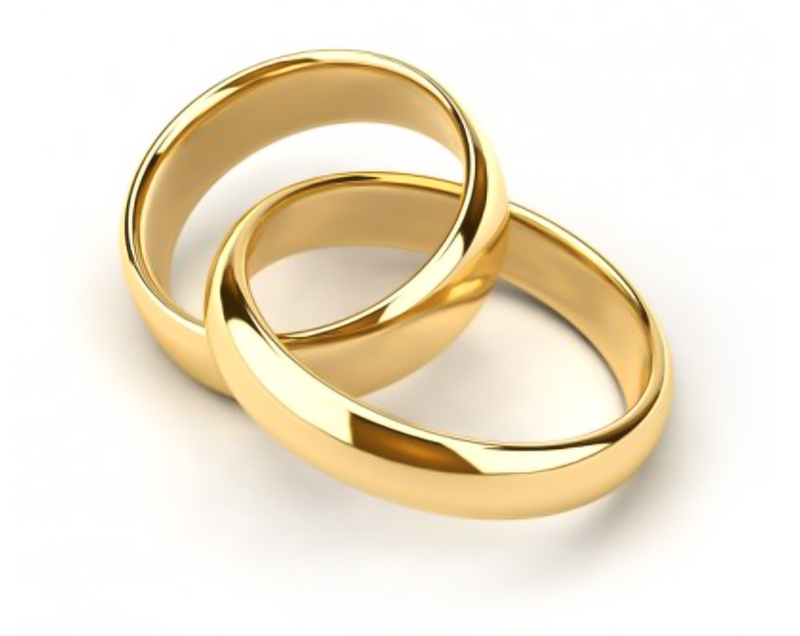 Many couples choose silver because the price is substantially lower than gold or platinum. This wonderful noble metal is a great choice for the budget conscious. For some people, adding an expensive ring to the wedding planning bill is just not affordable. 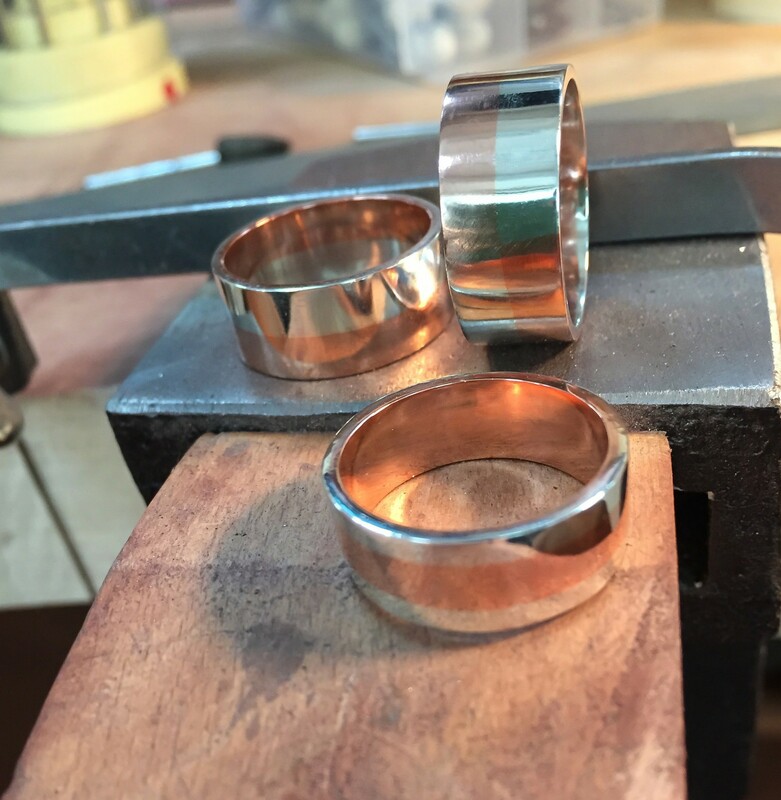 Some couples will buy less expensive silver with the view to upgrading their rings to a more durable metal at their one year wedding anniversary. Silver does tarnish over time, but with frequent and proper cleaning it can look wonderful for many years to come. Silver is often plated with rhodium, a hard and shiny white precious metal, to avoid tarnish. White gold is a harder metal than silver. It does not tarnish and it holds its shine very well. To increase durability, white gold is an alloy of yellow gold and at least one white metal, usually nickel or palladium. The higher the karat of gold, the softer the alloy. Of all the colours of gold, white gold is the most durable due to the mix of alloys. Many people are allergic to nickel. I make sure to use white gold alloy with palladium to ensure the metal is hypoallergenic. 18K white gold is 75% gold and 14K white gold is 58.3% gold. Hence jewellery made from these metals have a slightly yellow colour. To enhance the whiteness, almost all white gold is plated with rhodium. Depending on the amount of wear and tear on your jewellery, over time the rhodium plating may wear off, revealing the original metal colour. Jewellery can be replated with rhodium to restore the whiteness, if needed. Replating may need to be done annually, but is quite affordable for a nominal fee of $150 Hong Kong. Platinum is the hardest and most durable white metal. It is much denser and heavier than gold or silver. It can take much more day-to-day abuse before needing to be repaired, whereas silver and white gold need more care, particularly if they are rhodium plated. The stamp for platinum is 950 which means 950 parts out of 1000 or 95% pure. The other 5% alloy is either iridium or ruthenium – expensive materials in their own right. In other words, the metal is almost pure platinum unlike the other metals that have a greater proportion of alloys mixed to give them more durability. It’s rarer than gold and silver and more expensive, but a platinum wedding ring will last forever. If a platinum wedding ring is beyond your budget, consider buying a palladium wedding ring instead. In recent years, palladium has gained in popularity as a comparable, more budget conscious alternative to platinum. In terms of rarity and price, palladium rests between gold and platinum. Palladium is softer than gold, but not as soft as silver. Like platinum, the metal of palladium will be displaced, rather than lost, when scratched. Palladium is much lighter in weight than platinum and will scratch and bend more easily. A plus for palladium is that it retains its original shine longer than platinum, although it will eventually acquire the same dull, matte finish over time. Like white gold and platinum, palladium can be refinished to regain its original lustre. Due to its softness and malleability, gold is rarely used in its pure 24 karat form when forging a jewellery piece. Malleability means the ability to hammer, stretch and pull metal into new shapes. Instead, it is alloyed with other metals for hardness and durability. When pure gold is combined with these metals, it takes on a variety of rich shades that have become desirable in their own right. The most popular shade of the precious metal, yellow gold is used to create a majority of the fine jewellery on the market today, especially engagement rings and wedding bands. It gets its warm, lustrous hue from the silver and copper alloys with which it’s mixed. Within the yellow gold family, there can be a marked difference in colour based on the mix of the alloys and resulting karat weight. An 18 karat yellow gold ring will be richer and more brilliant in colour than one measuring 14 karats. However, a higher karat gold will generally be softer. Whatever ring you choose, it’s ideally for life. The above guide should get you started on making the best choice for your symbol of eternal love! Dede Marconato is a goldsmith and a Graduate Gemologist from the prestigious Gemological Institute of America. If you are interested in more information about designing custom wedding bands, please contact her at info@dedemarconato.com.